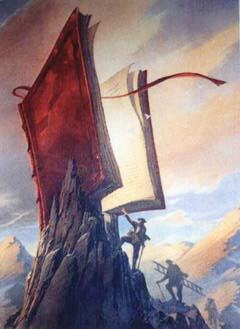 The Ultimate Book is the title of a serigraphy by François Schuiten. In our world, it is considered to be an allegory; in the Cities', one cannot be so sure. Given the nature of the Obscure World, it would not at all be surprising to learn that there is really an enormous book sitting on top of an isolated mountain somewhere on the Continent.